“We are at a curious, as well as critical, moment in our country,” write William J. Bennett and Robert A. White in their new book, Going to Pot. “We are spending money and political capital on strengthening the health, education, and productivity of our populace, yet society believes it appropriate to push for greater availability of a drug that hinders, and negatively affects (perhaps dramatically), those very efforts.” That drug is marijuana. Americans’ sea change of opinion on marijuana legalization has been slow but dramatic. In 1969, when Gallup began polling the issue, 84 percent of Americans opposed legalization, 12 percent supported it. By 2013, however, 58 percent supported it, 39 percent opposed. Support fell back to 51 percent in 2014, but the overall trendline is clear: Americans support marijuana legalization. Given that younger adults (ages 18 to 29) overwhelmingly support legalization—at 67 percent—proponents of continued marijuana prohibition face an uphill battle both in public opinion and at the polls. Regarding potency, Bennett and White write: “The average amount of THC in marijuana today, the primary psychoactive ingredient in the drug, is about 9.6 to 13 percent, more than double the potency of marijuana in 1983, which was more than double what it was the decade before.” Researchers at the University of Mississippi have identified strains with THC levels of 37 percent. Regarding the use of higher potency marijuana, Bennett and White cite a number of medical and scientific studies to document its adverse health effects. They include a 2014 study from The New England Journal of Medicine (NEJM) at the end of the book because its results typify what the other studies show. The authors acknowledge that THC has legitimate medical uses, such as “cachexia, multiple sclerosis spasticity, and vomiting [associated with chemotherapy],” among others. Unfortunately, the primary users of marijuana in states with medical marijuana laws do not indicate these conditions. For example, according to a December 2012 report by the Arizona Republic, “3.76 percent [of the states 34,000 medical marijuana cardholders] use marijuana to ease the symptoms of cancer. Another 1.53 percent suffer from glaucoma while 1.06 percent have AIDS.” These seem to be legitimate uses. “Meanwhile 89.8 percent—30,203 people—are seeking relief for ‘severe and chronic pain.’” The demographics of these users skew overwhelmingly to young men: “nearly 73 percent of patients are men and the people most likely to seek relief from pain are 18 to 30 years old.” This demographic skew is statistically suspect. One would expect a more even distribution between men and women, for one thing. For another, one would expect older patients to experience more pain than younger ones. That neither of these expectations are realized probably indicates that young men are using medical justifications to obtain legal access to a drug they use recreationally. In other words, they’re gaming the system. In light of both legitimate medical use and widespread abuse, Bennett and White suggest a medical protocol by which government agencies could monitor the use of medical marijuana to make sure that it is going to the people who need it. Absent such a protocol, medical marijuana is a farce, a foot in the door for legalization’s traveling salesmen. At the end of the day, the question of marijuana legalization comes down to costs vs. benefits. 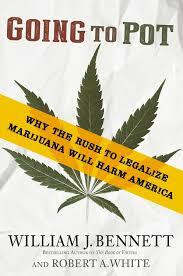 Opponents such as Bennett and White argue that the costs of legalization—the social costs of marijuana’s adverse health effects—outweigh any benefits; so American public policy should continue to prohibit marijuana use (with allowances for genuine medical need). Proponents argue the opposite: Like alcohol and tobacco—substances that also have adverse health effects—marijuana should be legally available. Do we really need that? The question seems to answer itself. You can learn too, Georgie! You don’t have to go out of this world completely wrong about this… You still have time to get on the right side of history and human compassion. Time’s ticking, though… Tick-tock, tick-tock, tick-tock…. Are you going to wake up from your slumber of ignorance?? Thanks for commenting, Jay! I prefer George or George Paul to “Georgie,” especially since I don’t know you. As a rule, ad hominem arguments are both distasteful and fallacious. Your parenthetical remark about William J. Bennett is both. Appeals to “the right side of history and human compassion” are also suspect. The former because it’s not entirely clear that history has a “right side.” Back in the day, for example, Prohibition was a progressive cause, and those who opposed it were on the “wrong” side of history. The latter because, when it’s not just a fallacious appeal ad misericordiam, it’s ambivalent. Presumably, you mean to incite my compassion for otherwise law-abiding marijuana users caught up in the maw of the law, or perhaps sick people who use it for medicinal purpose. Compassion for the former might lead me to support decriminalization, though not legalization. Compassion for the latter–and as a chronic pain sufferer, I understand the need for relief in a very personal way–could be handled through the very protocol Bennett and White suggest. If medical marijuana treats a genuine medical need, then it should be regulated like any other prescription drug. As a licensed foster care parent, however, I have a bit more compassion for the children of recreational drug users than for the users themselves. I have seen firsthand the way those parents misspend money on marijuana rather than on their children’s needs, neglecting them in the process. Sullum pooh-poohs studies about the deleterious effects of pot use. That’s fine. It should be noted, however, that various medical professional organizations take them quite seriously. The American Academy of Pediatrics opposes marijuana legalization. The American Society of Addiction Medicine opposes it. The American Medical Association opposes it. My guess is that Sullum, as a libertarian, would oppose prohibition even if studies showed marijuana had worse effects than alcohol and tobacco because of his understanding of the proper role of the state. That’s fine. Though we shouldn’t assume, as you seem to do, that legalization is the only rational point of view. Equally informed people can have reasonable debates about such matters. This was less a review than an uncritical endorsement of what appears to me an unpersuasive rehash of largely debunked arguments. Leading with the idea that we baby boomers don’t understand how dangerous today’s more potent marijuana is shows ignorance and fearmongering. I have smoked cannabis in both the sixties and the present day, and can attest that hashish and high-potency marijuana were both available (though less so than today) and sought-after in the Woodstock era. Bennett & White’s beer vs vodka analogy is both apt and inept. Any sensible drinker recognizes the difference on the first sip, and adjusts his consumption accordingly. The difference with cannabis of course is that there is no risk of poisoning oneself. Furthermore, warnings about health consequences and highway carnage become increasingly unconvincing as further studies are done. Several large-scale epidemiological studies have shown no link to lung cancer or COPD, the NHTSA has found no significant increase in accident risk, and last year’s widely touted paper about structural changes in teenage brains has been called into question by a larger and better-controlled repeat study. Appeals to authority are looking less and less authoritative as the authorities themselves appear to be reacting out of ignorance and fear. Finally, any cost-benefit analysis has to include the cost of the drug war, both in dollars and ruined lives. You and Bennett both seem to be minimizing that impact in your arguments.